Home family life	I never thought I’d say this, but I’m not ready! I never thought I’d say this, but I’m not ready! Yesterday my boy turned four. As a summer born baby myself you have a certain sense of entitlement to a garden birthday party, but this year the summer has been anything but reliable and we obsessively watched the weather forecast all week as the outlook for Sunday wobbled between rain and sun. In the end it was overcast but incredibly muggy and more than good enough for the kids to play in the garden. After two hours of games, food and cake the party bags came out and the majority of his and our friends headed home. Inside the party bags were some extremely cheap Poundland waterpistols (4 to a pack I think!) which turned out to be surprisingly good and that’s where the fun really started! 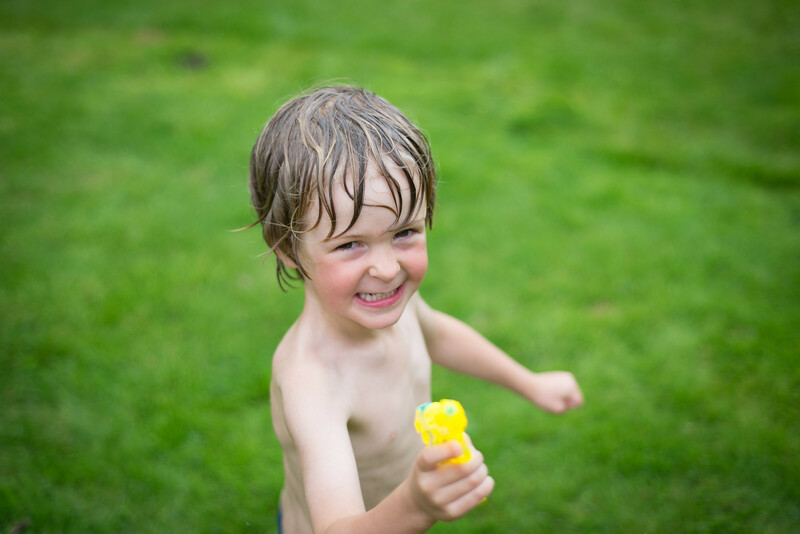 Off he went, running round the garden with three pals, drenched through and squirting water at everyone with Daddy in hot pursuit carrying a watering can! It was glorious and carefree, but on the horizon was a cloud that I kept trying to ignore. Celebrating his birthday with him were four small children who will all be in his reception class next week and it made me suddenly realise that this is it. He’s four. His journey through full-time education is about to begin and our wonderful summer together as a full-time family of three is about to end. A week today he starts school and Jim returns to weekly commuting after five weeks at home and when the front door closes on Monday morning it will just be me at home for the next two months. I don’t struggle to fill my time, but even so it’s going to be a big shock to the system and I never thought I’d be one of those mother’s who says this, but I’m not ready. The weather’s been terrible, but I want this summer to continue forever with endless picnics and DIY projects, the adventure of a new car, outings, barbecues and family dog walks, but I know it can’t. So this week we shall try to make a few more memories and when next week comes, I shall try and focus on the baby who shall be joining us in October and the million and one things that need to be done before he or she arrives. This picture sums up childhood so perfectly for me. Theo is adorable and I’m glad that he had a super birthday, although sooo jealous that you get to throw summer birthday parties. I have no idea how to handle mid-October parties; where will there be light?! Fab photos. Glad the weather held out for the party. We also have Poundland water pistols, they’re definitely the best ones for little cheapies. N starts school this week. He’s ready, and for me, it won’t change that much because I’ll still be at work, and at the moment haven’t had to change my hours. But it does feel like we need a bit longer time off to recharge and prepare. For us it has been Winter and now finally Spring is here holding the promise of sunshine on its way. After 10 days on warm holiday I am looking forward to the Summertime. Your photos are beautiful and make me long for warm weather even more. I understand you wanting to hold on to these moments with your little boy it goes way too quick. Looks like he had a wonderful birthday! I’m sure he’ll love school but it is so strange sending them off. I’m a little sad that September has come so quickly, time is just whizzing by and I don’t like it!